Favourable pricing across the 2019 RAV4 Hybrid line-up with a starting MSRP of $32,090 places a competitive increase of $1,400 against its respective conventional RAV4 gas grade. TORONTO, ON – January 18, 2019 – The first-ever Toyota RAV4 was a game-changing model when it launched – and now the 2019 Toyota RAV4 Hybrid is ready to rewrite the rules, all over again. That’s because this all-new hybrid compact SUV proves – without a doubt – that Toyota’s gasoline-electric hybrid technology results in a superior powertrain at a price that makes remarkable sense. The 2019 Toyota RAV4 Hybrid shares many features in common with the 2019 Toyota RAV4. Both are the product of the Toyota New Global Architecture (TNGA) – a tight integration of design and engineering that results in a superior platform and powertrain. All 2019 RAV4 models – regardless of powertrain – feature many advances over the previous generation models. These include fresh, bold styling, improved power, handling and stability, additional standard features including Toyota’s industry-leading safety system, and a long list of standard and available technologies. But then the RAV4 Hybrid does more – much more. Built around the Toyota Hybrid System II – the latest iteration of the world’s most proven and popular gasoline-electric hybrid technology – the RAV4 Hybrid features a 2.5-litre Dynamic Force 4-cylinder Atkinson Cycle engine coupled to high-torque electric motor/generators and a smooth and efficient continuously variable transmission. The result is a 219-net system horsepower. What’s more, Toyota’s newest All-Wheel Drive system (AWD) increases torque to the rear wheels by 30 per cent over the previous generation’s AWD-i system – contributing to an unparalleled driving experience. Drivers can travel further with the electrified RAV4’s hybrid powertrain which takes a big bite out of gas consumption. Featuring class-leading fuel efficiency, the 2019 RAV4 Hybrid offers a remarkable 6.0L / 100 KM city/highway combined (5.8L city; 6.3L highway). That’s vastly improved over the already impressive 7.3L / 100 KM combined rating of the previous RAV4 Hybrid. And the RAV4 Hybrid does all this with a starting MSRP that’s just $1,400 above the equivalent, conventionally-powered RAV4 model. Toyota has closed the price gap significantly: For example, the 2018 RAV4 Hybrid LE was $4,775 more than its 2018 gasoline-powered equivalent. For most drivers, it’s expected that the fuel savings alone will pay back that premium for the RAV4 Hybrid in approximately 2.2 years – and over the lifetime of the vehicle, the cost of ownership will actually be less. The 2019 Toyota RAV4 Hybrid LE (starting MSRP: $32,090) is impressively equipped. Standard technology features include a 7” Display Audio system enhanced with Entune 3.0 Audio including Entune App Suite Connect and Scout GPS, Apple CarPlay. Other features include dual zone automatic climate control, a 4.2” multi-information display, LED daytime running lights, and more. Standard safety systems include Toyota Safety Sense 2.0 – the second generation of Toyota’s bundle of active safety technologies that enhance driver capabilities – plus the Star Safety System, eight airbags, a vehicle proximity notification system (active when a hybrid operates in EV mode), and Blind Spot Monitor with Rear Cross Traffic Alert. Style-wise, this model features 17” alloy wheels, hybrid blue emblems, roof rails, a spoiler with LED stop lamp and Parabola LED headlamps. The 2019 Toyota RAV4 Hybrid XLE (starting MSRP: $35,090) builds on the LE grade, adding unique 17” alloy wheels, a power moon roof, eight-way powered driver’s seat, a power back door, projector LED headlamps, smart key system with push button start, a heated leather-wrapped steering wheel, rain sensing wipers, fog lights, five USB outlets throughout the cabin, dual chrome exhaust tips, chrome inside door handles, and LED rear combination lamps. 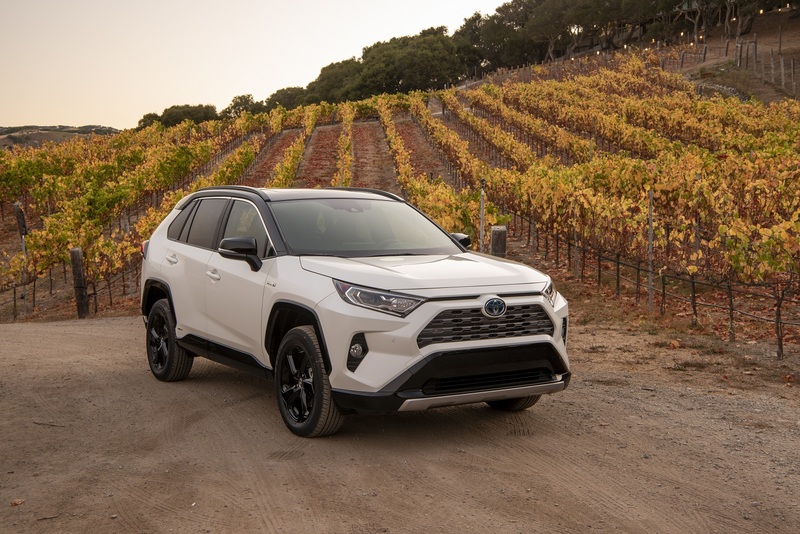 The 2019 Toyota RAV4 Hybrid XSE with Technology Package (starting MSRP: $40,890) combines sportiness with a massive infusion of powerful yet user-friendly technology. Upgrades from the XSE package include a nine-speaker JBL Premium audio system with Clarifi technology, the Entune Premium Audio package with embedded navigation, a digital display rear view mirror enhanced with HomeLink, intelligent clearance sonar system, intelligent parking assist, rear cross traffic brake system, and a wireless charging system for compatible smart phones. The 2019 Toyota RAV4 Hybrid Limited (starting MSRP: $42,090) completes the hybrid lineup with an exquisite package of technology and luxury. Built on the XSE+Tech Package, this model features the traditionally-tuned suspension and fog lamps. Exterior styling cues include unique 18” alloy wheels, a unique front grille, chrome exterior door handles and exterior mirrors equipped with puddle lamps. The power back door has a hands-free feature for easy operation. Inside, the cabin features heated and ventilated front seats and heated rear seats, all wrapped in Softex leather, while the eight-way power adjustable driver’s seat includes a memory system linked to the exterior mirrors.